I recently got to visit Casa de Frida in Mexico City. It was a highlight of my week-long vacay, which consisted of market-trawling, mariachi-listening, and taco-eating. Personal tragedy can be made into something powerful. Frida used personal trauma as a main theme in her paintings, turning them into something to be shared rather than hidden. She painted about her miscarriage and unfulfilled desire to become a mother, and she was totally uncompromising in her portrayal of the female body. She bared her experience and her real emotional responses and didn’t aim to make any of it look “better” or any different from what it was. Your relationship is whatever you choose it to be, and that’s okay. Frida and her lover Diego had separate bedrooms (the house has several). They had numerous affairs with other people, were married, divorced, and married again. They were both passionate artists and activists – why would their relationship be without passion and tumult? To some people’s standards it would be a nightmare to be in that relationship, but Frida and Diego were just doing them and I’m sure sometimes it was good, and sometimes it was not good. Point is: they’re one of history’s most iconic power couples and each made serious impacts and supported each other in their own ways. Colourful details make life magical. I thought this when I saw Frida’s four-poster bed and saw that it has a butterfly shadowbox on its ceiling. Colourful details are all over the house – tiles and designs on her kitchen walls, on her chair and table legs, in her garden. Did she know that people – anyone – would see them all? Probably not. The personalized details she put into her space are what made her life seem magical, to me. Your choices can make a statement. 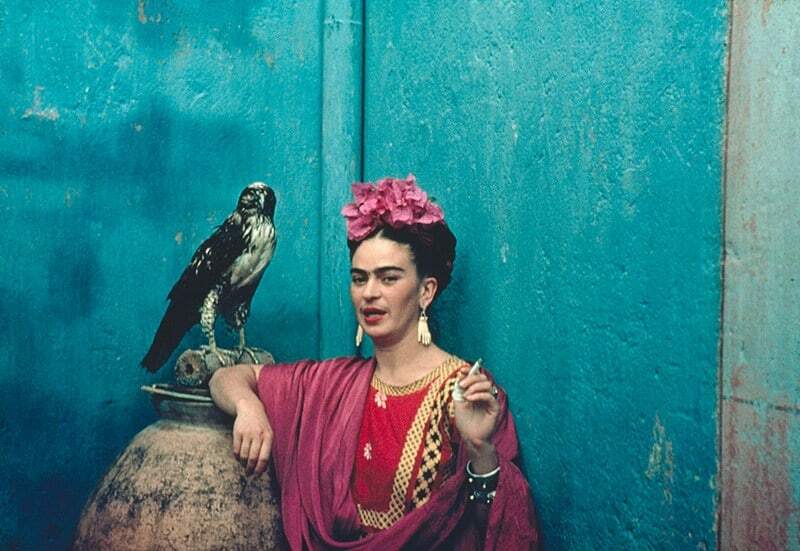 To Frida, her clothes were a way to express her freedom and personality. She was, in every sense of the word, radical. She refused to blend into the background and her clothes said that. Seeing her Tehuana-style dresses on mannequins was really humbling and inspiring and definitely made me consider investing some more thought and money into my own wardrobe. Physical obstacles don’t have to stop you from leaving a legacy of beauty. Frida contracted polio at age six, was in a car accident at eighteen and had to wear a plaster corset, and had her leg amputated close to her death. Still, she became a beauty and style icon. Time magazine sums up, to me, her creative approach to adorning her body: “Even in the final moments of her life, she remained elaborate and designed her prosthetic leg with a red boot decorated with Chinese embroidery and a small bell.” Because FRIDA. Now, whenever I wish my apartment was better, or that I was taller, or anything like that, I will think of the creative universe that is Casa de Frida and remember, it’s all in the ‘tude. Having a “great life,” starts with having a creative perspective on the daily. Frida’s house is a perfect example of that.